by Foye Belyea & Samuel Huggard / Buy the Book! If you want to journey through life actively engaged in following Jesus rather than just learning the facts about Him and attending religious services, then we invite you to join us in learning and living The Five Stones. This book is a guide to an everyday life in Christ that begins in the hearts and homes of those who desire to follow Jesus. Briefly walk the everyday discipleship path of the Five Stones.
" 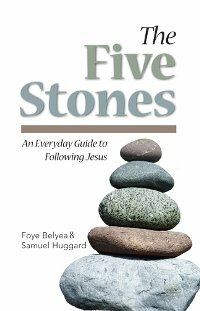 Using the illustration of a cairn, a rock marker, The Five Stones is exactly what it is said to be: an everyday guide to following Jesus. Like many books of similar intent, this book is the authors' method of helping a Christian--whether old or new--to walk more in step with Christ. This has an advantage in that it is the work of two men, so it does not tend to get a rather narrow view of the process. This wider view is seen in the short narratives by each author about events and/or issues in their lives. At the end of each chapter, the book gives a few thought provoking questions, which should help the readers work on the material presented in the text. A couple things in The Five Stones are a bit different than I've seen in other books. They discuss the rhythms of life and how they can have effect on the Christian life. Can't say that I've ever seen that before; but it gave me something to chew on; I liked it. The other different thing was the combination of "Centered and Sent" in the last chapter--the top stone of the cairn from which the book draws its concept. It's clear there that the end goal is not for our benefit; but for the benefit of the one follow. "Foye Belyea and Samuel Huggard have provided readers with a fresh, insightful, readable, and practical guide to help Christ-followers move toward a life of kingdom faithfulness. The Five Stones will encourage transformative and Christ-centered discipleship, as well as the strengthening of churches, small groups, individuals and families. I am pleased to recommend this fine book." "This is a refreshing, challenging, highly practical book that will be very helpful in showing people how to live in the presence of Jesus each day." "There is a lot of discussion today among church leaders about the importance of making disciples. What's missing are actual practitioners-people who are living a lifestyle of disciple making. What I love about this book is that it is not offering theory but rather practices that actually work. Implement the insights from this book and watch the impact of your life significantly increase." Alan Kraft, Author of More: When a Little Bit of the Spirit is Not Enough, and pastor of Christ Community Church, Greely Colorado. "Whether developing a new church plant or revitalizing an existing congregation, the non-negotiable key is always making disciples. Discipleship is a buzzword today in many Christian circles, but too often it is equated more with providing information than fostering transformation. Five Stones is an incredible tool to both explain and lead people through truly transformative discipleship. I cannot recommend it more highly." "The world today as well as the church are demanding that the way of Jesus be lived out in and through our lives and not just something we talk about. The Five Stones powerfully and practically addresses what it means to live out the way of Jesus beginning in our own lives, our families and in our churches. Beginning with the scriptures, the authors provide everyday practices that are especially effective for marriages and families, which people in the church today desperately need. I believe this book will help raise up a new generation of Christ-followers and disciplemakers who will transform families, church, communities and the world." "The Five Stones presents a challenge to move beyond knowledge and into practice. The authors desire implementation and not just information. I commend them and share the desire to see a generation live out their faith for God and our nation revived. I encourage you not only to read this book, but to live a life sold out to Jesus." "People who are serious about doing real discipleship with real people in the real world need to read "The Five Stones Primer". Foye and Sam have done an excellent job outlining an approach to discipleship that is both biblical and practical. Their work is clear and insightful, as well as passionate and full of conviction. The Christian life is much more than a set of doctrinal beliefs or an assertion of faith. The Christian life is to be lived. This book inspires and instructs Christians to live that life as Jesus intended." "The only imperative in Jesus' Great Commission (Mt. 28:19) is to make disciples. This book goes a long way in enabling us to understand the meaning of discipleship as a way of life under God's reign that touches all dimensions of everyday life. With richness of Scripture, suggestions for reflection and daily practices, this is an exceptional tool for personal, small group and church use. I highly recommend it."